That’s because refunds, which have averaged around $3,000 in recent years, can provide many approved buyers with a ready-made down payment on their next ride, or at least a useful chunk of it. In turn, that money down may drop their monthly payment and provide useful savings on interest charges. 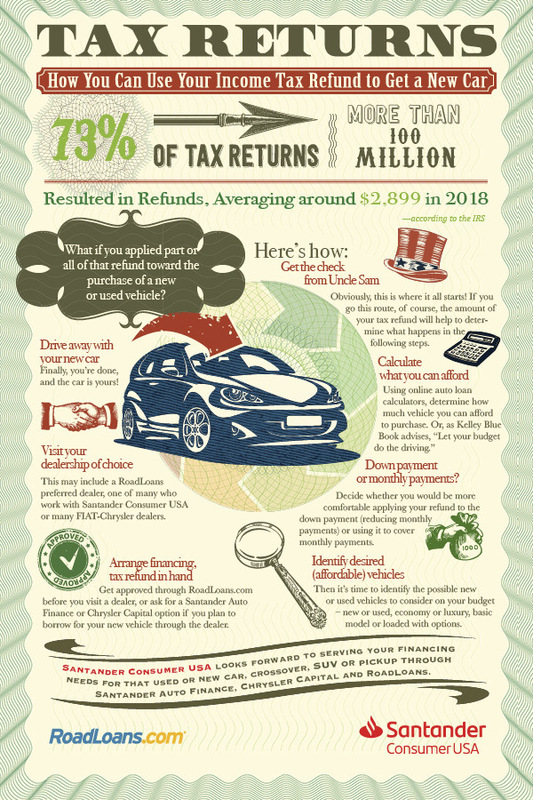 Take a look at the following infographic to see how a tax refund may be used to get a new or used vehicle in six straightforward steps. Let’s see what kind of difference a tax refund might make when financing a car. A $3,000 refund, for example, goes a long way toward covering the typical 12 percent down payment on the average price of a new car, which was $37,577 in December 2018, according to Kelley Blue Book. It would also more than cover 12 percent down on a used vehicle, with an average price of $20,085 in the third quarter of 2018, according to Edmunds data. Here’s how such a down payment might lower your financing costs. Let’s say you’re looking at buying a car for $20,000 and you have a trade-in worth $5,000. Using Concord Cars’ auto loan calculator we can see that entering a loan amount of $20,000 (effectively $15,000 after the trade-in value), with a 60-month loan term, 2.9 percent APR, and $5,000 in the down payment field results in an estimated monthly payment of $269. Adding $3,000 from a tax refund to make a total down payment of $8,000 reduces the monthly payment to $215 – a potential saving of $54 per month – and may also save you money on interest. This is another option for using a tax refund for a car purchase. Instead of allocating the money as a down payment it could be used for making a number of monthly payments on the new auto loan. A refund of $3,000 could be used to make 11 payments of $269; almost a year’s worth on a five-year loan term. Not a bad start. With an idea of what you can afford and how using a tax refund may lower your costs, you’ll be in good shape to research vehicles and make a great choice at the dealership. Turning your thoughts to auto lenders, consider getting preapproved for financing before you go. Preapproval offers the advantage of knowing the terms of your auto loan, including the total loan amount, duration and APR, up front so you can shop with the confidence of a cash buyer, loan voucher in hand. Direct-to-consumer lenders like Concord Cars enable consumers to apply online in minutes and get an immediate decision. If approved, review the terms of your approval, download and print your loan documents and take them with you to the dealership listed in your packet. Alternatively, use Concord Cars’ dealer locator to find another option. Each is able to show you select new and used models meeting our standards for age, mileage and financing. If you have an existing car loan, using your tax refund to pay down the principal may save you money on interest over the remainder of the contract. Use an amortization calculator to see how adding to or subtracting from your principal and interest affects the loan and total payments. If it turns out that you owe funds to the government rather than are due a refund, refinancing your existing vehicle loan may be a means to get money for your taxes and possibly improve upon areas of your existing note. A cash-back refinance† of your existing auto loan is a way to get a new loan and at the same time get some cash. The cash in hand adds to the loan’s principal, which does make the loan larger. But if your credit has improved over the course of the loan, or interest rates have fallen, then you may be able to get better terms on the refinanced loan, such as a lower APR. Concord Cars accepts applications for both cash-back and traditional refinancing. Millions of consumers receive tax refunds from Uncle Sam every year, and many of them put that money toward purchasing their next car, truck or SUV. Whether you’re shopping for a new or used vehicle, apply for financing and see what the options may be. Apply for auto financing and get an instant decision.